Note to anyone mulling Father’s Day gifts: Guys dig watches. And no one makes timepieces like Tokyoflash (www.tokyoflash.com). The company uses unusual materials to make its watches, which display the time in the most curious ways, through colorful, funky LED lights and LCD screens. I already own Tokyoflash’s Jackpot watch, which has a retro, red LED display fixed within a shiny, metallic face. But I hope someone will think to gift me with Tokyoflash’s latest jewel, the Kisai RPM Acetate ($159). Makers of jewelry and eyeglass frames like acetate for its glossy, silky finish, and because it can be infused with cool colors and wavy patterns. Tokyoflash says the face of the Kisai RPM Acetate, and each link of its band, are hand cut, machined, and polished. It’s available in several colors, and with several patterns. You’ll need to check the Kisai RPM Acetate’s manual before you check the time. Rather than numbers around a dial, the watch has LED lights around the rim of its face that break the day down into bricks representing hours, and five-minute and one-minute intervals. And to recharge the battery, you have to unscrew a small panel, and plug the watch into your computer. It is inconvenient, yes. 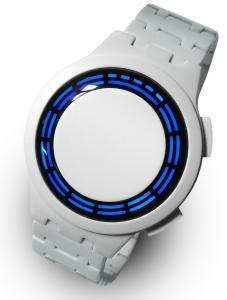 But a single 3 1/2-hour charge will keep the watch running for a month. The battery itself is replaceable. It should last for many years (or 300 charges), according to Tokyoflash. The RCX5 from Polar USA can offer many insights to any athlete in training. Think of it as a wrist-worn medical tricorder; like the ones in “Star Trek,’’ it can take heart rate readings. It also records your speed and pace while you are running or biking. The gadget works wirelessly with other sensors, such as a waterproof heart rate monitor, to gather data about your fitness level and training progress — which you can then view in colorful charts and graphs on your computer. It records your speed and distance with Polar’s USB-rechargeable GPS sensor, the G5, which you wear on an armband. Another device for runners, the s3+ stride sensor, rides along on one of your shoes, recording your running cadence and the length of your strides. Prices for the RCX5 start at about $350.